Grammar practice does not have to be boring! 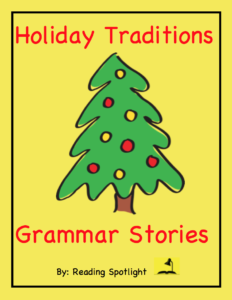 Students can learn about origins of Holiday Traditions (such as greeting cards, carols, plants, foods, Santa Claus and more…) while practicing grammar skills. Great for homework, seatwork, and learning centers. Answer Key + explanations for each correction included. Also, be sure to check out the FREE parent flyer, Great Gifts for Children, in the Reading Spotlight TpT store.